A 21-year-old daredevil was fined for traffic violations after shooting a video in St. Petersburg where he shows off his snowboard tricks while attached to a moving car. 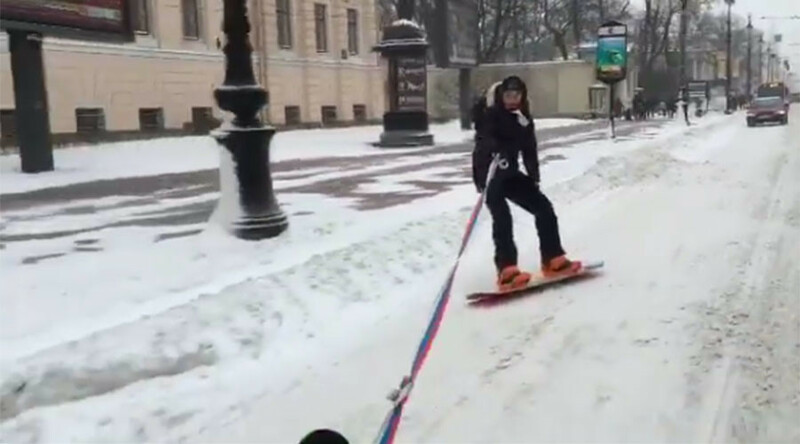 Student Kolya Smirnov posted the video on his Instagram account, saying it was his second attempt at riding a snowboard smack in the center of Russia’s second largest city. Temperatures have dropped below -20C (-4F) in St. Petersburg in the past few days and there has been heavy snowfall. Deciding these were ideal conditions, the young man decided to take advantage of the weather and pull off a few tricks. “Ripping snowy St. Pete’s to pieces,” he captioned the video. Extreme sports lovers frequent the city streets when the weather is right - much to the delight of internet users worldwide. Wakeboarding, snowboarding’s summer alternative, earlier made a roaring appearance in a video where several young men showed off a similar stunt – except on water, not snow - in flooded Vladivostok in Russia’s far east. Both Smirnov and the driver that pulled him through the snowy streets were identified via security cameras and were fined by the police.